This is in opposition of my last post. I get both sides of it, I guess. I came across this meme on some social media site in October. 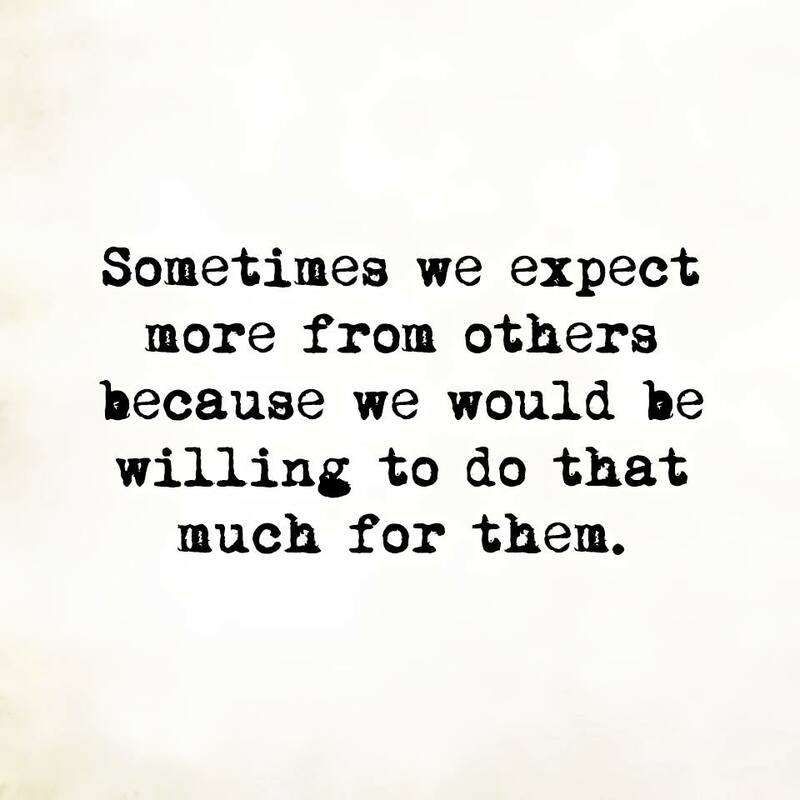 It really hit home around then, because I was expecting a LOT from so many different people and it seemed they were failing me left and right. Seeing this I realized I was placing this unspoken pressure on them. Not only did I want them to meet an expectation I had, but I’d never even mentioned it to them. In each situation it wasn’t a materialistic expectancy. I’ve figured out all of my expectations with others are emotional or relationship based. And the reasons I may just expect it and not speak about it is because I struggle with being vulnerable and I’m ALWAYS there for others emotionally without request. Shouldn’t I be given the same? ‘Well, yes, yes you should be given the same Viola’ is exactly what I’d been telling myself. With that mindset I endured loads of disappointment that I carried with me into any conversation or situation I’d had with that individual I’d placed expectancy on. I had to get over thinking I was obligated to receive the same. I realized what I already knew, everyone isn’t programmed the same, and I’m placing myself in this realm of disappointment. Everyone isn’t willing to reciprocate what’s given to them in a positive manner. And that’s okay. I can’t fault anyone for that. I shouldn’t fault myself for that either. Growing up it took awhile for me to really see color. I mean I noticed it, but it wasn’t a big deal to me. A little girl in the hood, I thought everybody was just like me; we all had mamas, we all took the bus (207 and 218), we all ate off of food stamps (the color paper not the card labeled by three letters), we all lived in the hood. You get it. The differences that I saw were hair and money and, well, hell, money wasn’t a worry of mine. Where I grew up (both neighborhoods) was nothing but Black African Americans and Mexicans/Hispanics. We saw white people on tv and a billboard here or there. Again, didn’t mean anything. They were soo far away. Only not really we just didn’t see them often in our everyday lives. I assumed they all lived in the valley, which I didn’t think had a hood and they all had money and cars. My mother and other adults and kids around me always told me how pretty I looked and how beautiful I was. Even when I encountered people of other races and complexions I was complimented. You couldn’t tell me anything. I KNEW I was beautiful and maybe even conceited back then. I saw how light skin and white girls were everywhere on tv, but in my household and my neighbors there were pictures of beautiful, royal black folks all around. TV was just tv which I put in the categories of movies meaning not real just for show.